The Voodoo Lab Pedal Power 2 Plus power supply can handle most any situation possible and comes with an assortment of power cables. The Pedal Power 2 Plus is hand made in the U.S.A. It features a toroidal transformer and completely isolated outputs to insure noise free operation. We stock a huge selection of extra cables. See below for cables. Pedal Power ISO-5 is an isolated power supply for powering guitar pedal effects and accessories. It’s the ultimate compact solution for smaller pedalboards, rack shelves, or even as an additional power supply for larger boards. With five isolated, filtered and regulated output sections, ISO-5 keeps even the most sensitive vintage and boutique analog pedals dead quiet. Pedal Power ISO-5 includes a high-current output section and a dedicated 18V output. Nice! Pedal Power Digital is a linear (analog) power supply for high-current DSP-based pedal effects and accessories. With 4 completely isolated, filtered, and regulated output sections, Pedal Power Digital keeps your pedals dead quiet and free from high-frequency noise that occurs with digital “switching” power supplies. Pedal Power Digital will properly power up to 4 digital power-hungry effects like those from Strymon, Eventide, Line 6, TC Electronic and more. It’s compact and powerful. Pedal Power 4×4 is a linear (analog) power supply that can properly power up to 4 digital power-hungry effects like those from Strymon, Eventide, Line 6, TC Electronic and more, plus 4 standard 9-volt battery stompboxes. Perfect for large pedalboards, Pedal Power 4×4 features 8 completely isolated, filtered, and regulated output sections that will keep your pedals dead quiet and free from high-frequency noise that occurs with digital “switching” power supplies. NOTE : This is for devices requiring “AC” power, not “DC”. The Voodoo Lab Pedal Power AC is a pedalboard power supply designed to operate high current and AC powered pedal effects. Finally a professional solution for powering tube overdrives, modeling pedals or devices including the Whammy, POD, Rotosphere and many others without wall warts. The Pedal Power AC provides two 9VAC and two selectable 9VAC or 12VAC outputs. It features a toroidal transformer and completely isolated outputs to insure noise free operation. A simple, effective and most affordable method for powering your 9-volt effect units. The 1.7 Amp current capability can power over twenty 9-volt effects. Includes Cable-5 daisy chain connector and assorted jumper cables to power phone plug, reverse polarity, battery-only, and Line 6 units. Extra standard and custom cables are available. A vast selection of stock or custom lengths, plugs, polarities and configurations to suit most any application. Includes the standard 2.1mm Boss type plugs, reversed 2.1mm plug, Y-cables for powering 2 – 9 volt pedals using only 1 output, double volt cables to power an 18 or 24 volt pedals using 2 outputs, Line6 cables, 3.5mm mini plug cables, extension cables; reversed extensions, bare wire for DIY applications and more. We support just about any power supply. Power Blocks, Strips, Extension Cords and IEC Detachable Cords. Here are some of the best solutions for AC power distribution. 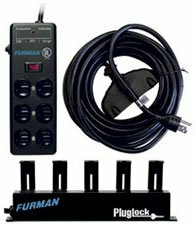 Furman, ProCo and other professional line products offer high quality and road worthiness that looks and performs great on any stage.